This Flash interface was built to demonstrate the capabilities of Polaroid's PTX 4000 line of sunglasses. 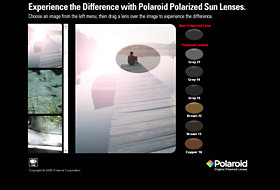 Each type of lens can be dragged over the center image to show its polarizing properties. The interface was used as a stand-alone application in sales presentations as well as being integrated into several web sites.